State Does Not Provide Signs. 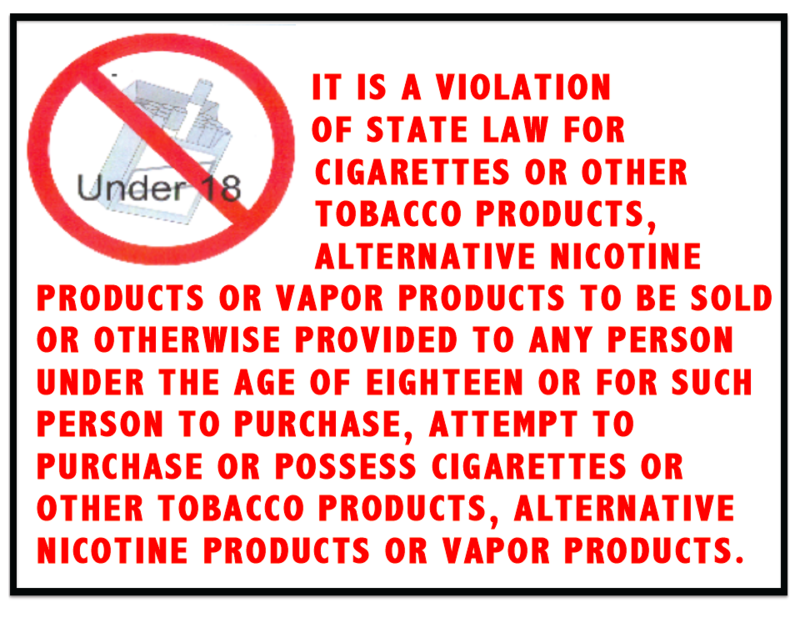 "Alabama law strictly prohibits the purchase of tobacco products by persons under the age of 19. 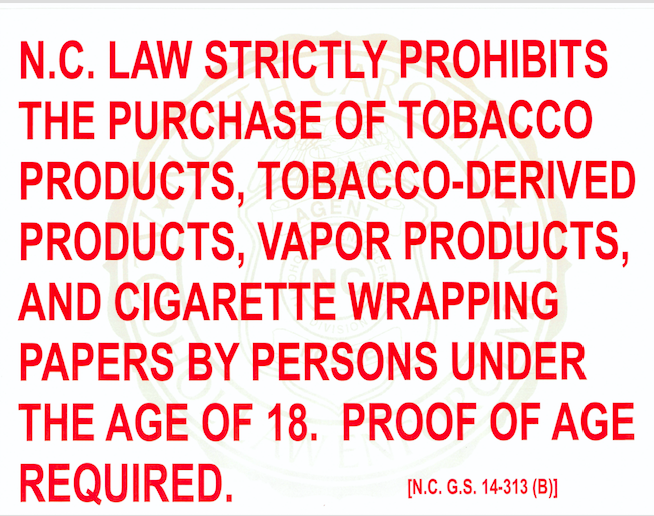 Proof of age is required for the purchase of tobacco products." Contact The Alabama Alcoholic Beverage Control Board for more information. See this list of contact numbers. New sign required by Jan. 1, 2019. 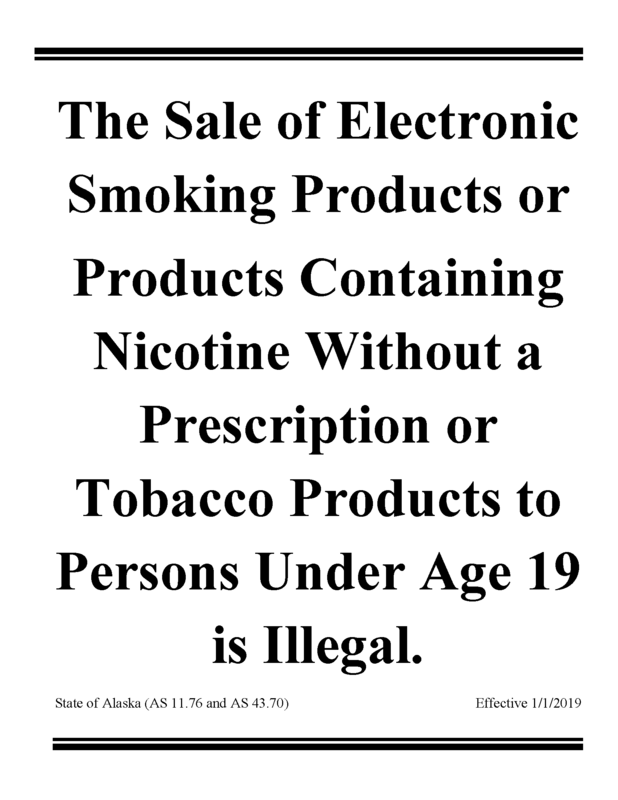 Contact this Alaska government agency by Dec. 2018 if you have not received a state-supplied sign. HARD COPY: Department of Community and Economic Development, Division of Occupational Licensing. Anchorage (907-269-8173), Fairbanks (907-451-2852), Juneau (907-465-2550). 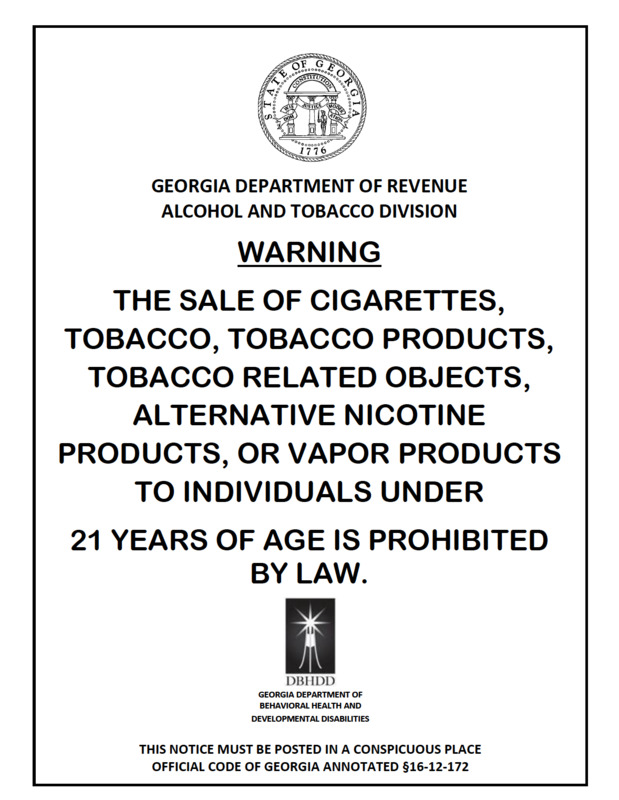 ONLINE: Download and print the state required Warning Sign. 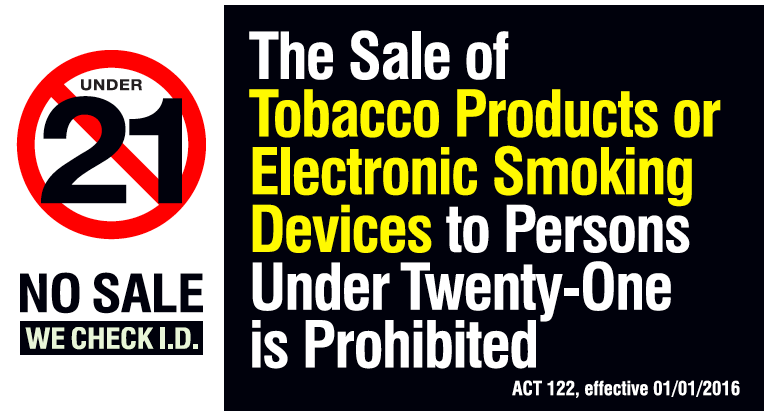 HARD COPY: Send a self addressed stamped envelope and a letter with how many signs you are requesting to: Arkansas Tobacco Control Board, 101 East Capitol Ave., Suite 401, Little Rock, AR 72201-3826. ONLINE: Download a pdf of required sign. 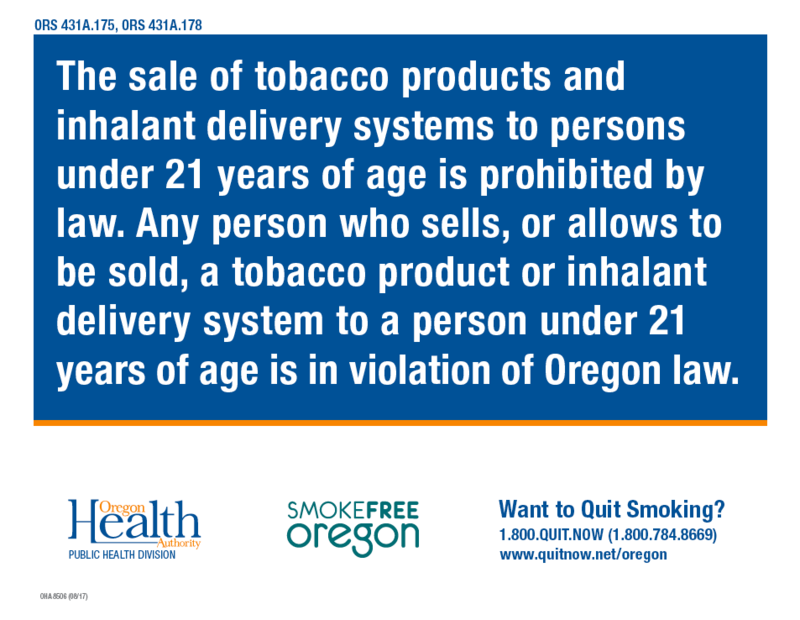 HARD COPY: Free signs may be obtained by contacting Tobacco Education Clearinghouse of California at 1-800-258-9090 ext. 230 or ext. 103. 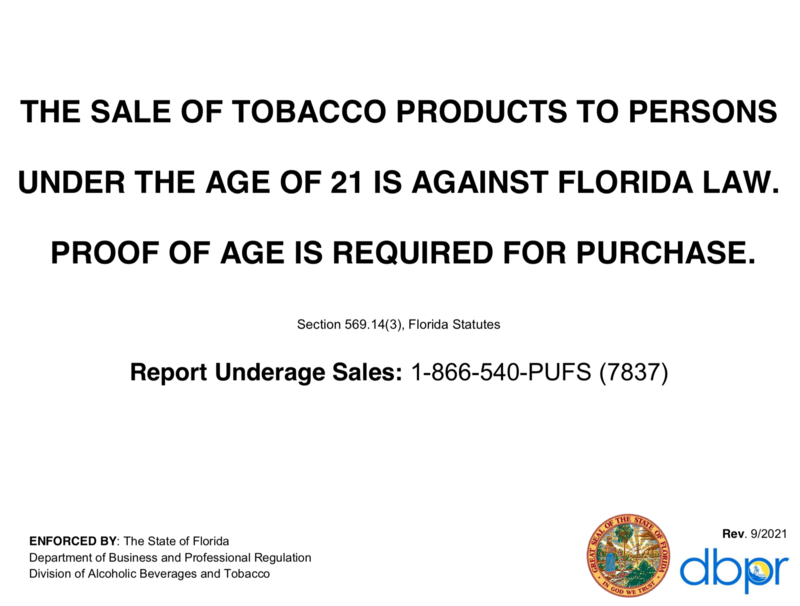 HARD COPY: Contact the Department of Revenue, Liquor and Tobacco Enforcement Division. For a list of contact numbers, visit here. 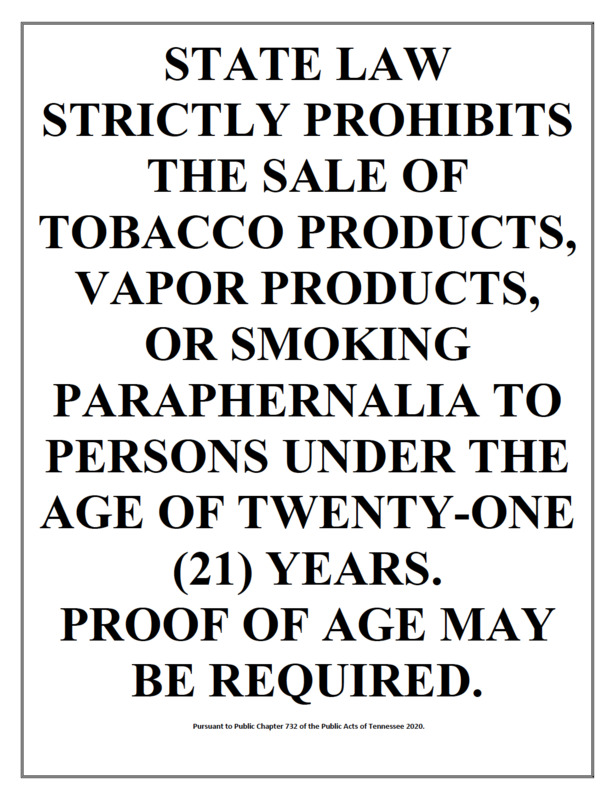 HARD COPY: Obtain a sign to print here. HARD COPY: Contact IDHW-BEHAVIORAL HEALTH/SA-ADMIN, Boise, ID 83720 208-334-0642. 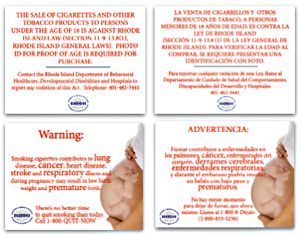 A copy of the sign must be provided with each permit issued by the Department of Health and Welfare. 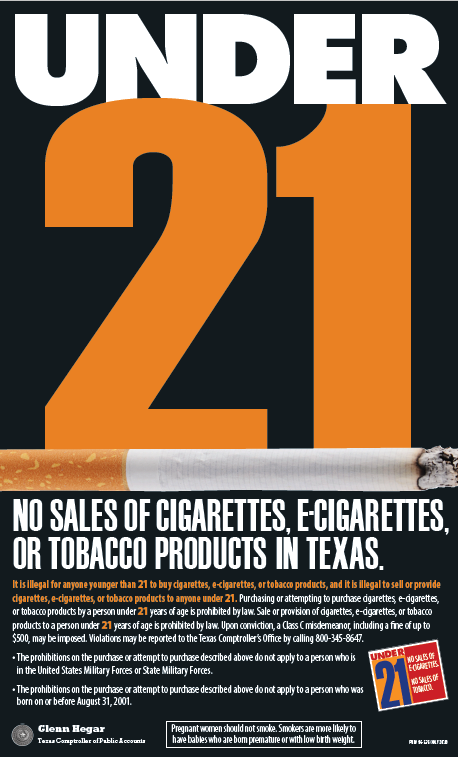 Contact The Louisiana office of Alcohol and Tobacco Control for more information. 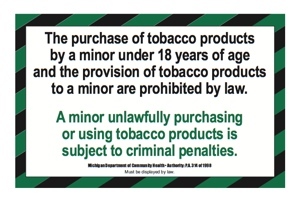 New 21 year minimum-age sign must be posted by July 1, 2018. 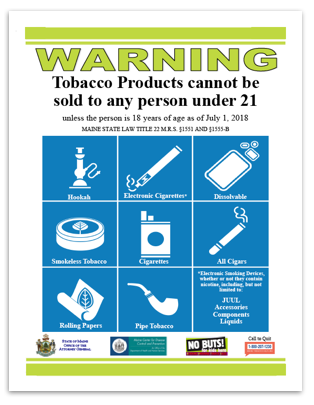 HARD COPY: Contact The Massachusetts Department of Public Health, Tobacco Control Program at 617-624-5900, or contact your local board of health. 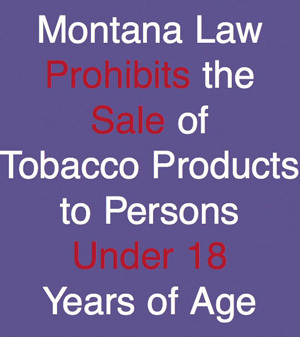 State law prohibits the sale of tobacco products to persons under the age of 18 years. Proof of age required. HARD COPY: Contact the NC Alcohol Law Enforcement Division at 919-622-4500. ONLINE: Download a pdf of required sign(s). 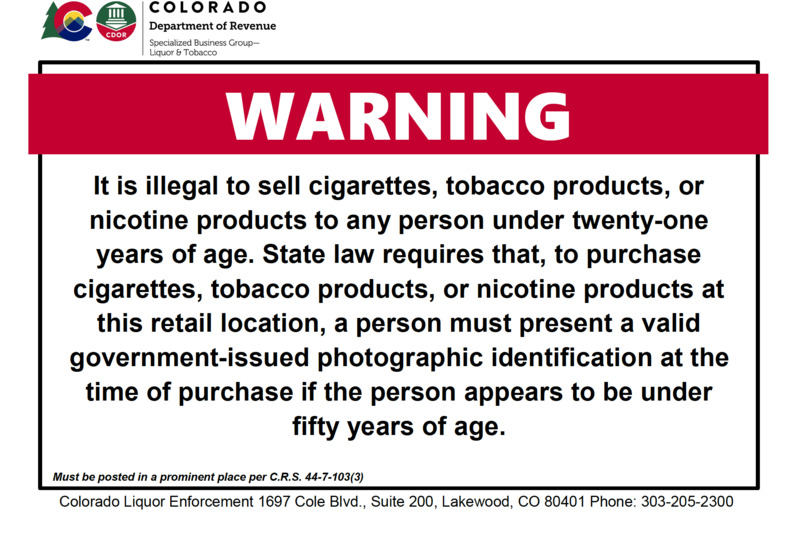 Retailers must post a sign in a conspicuous place that states that giving, selling, or otherwise distributing cigarettes or other tobacco products, or papers used to roll cigarettes, to a person under 18 years of age is prohibited by law. 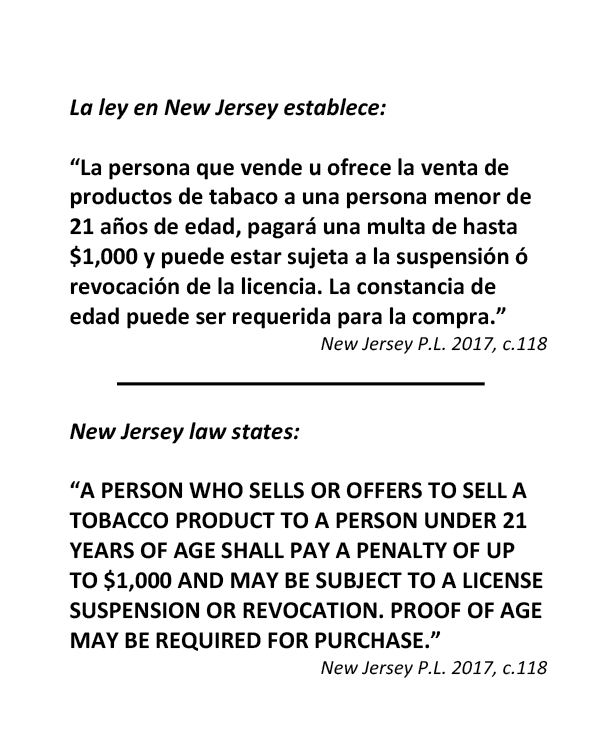 Download English or Spanish language signs -- available here. HARD COPY: Exact duplicates may be made.